The Mole had previously speculated that Andy Robinson bestowing the Scottish captaincy on Alaistair Kellock would prohibit him from selecting his best second-row partnership. The ex-England coach has shown his ruthless streak with his selection for the key fixture against Argentina on Sunday however. Kellock isn’t even in the matchday squad. Robinson has made the tough calls on form. The unfancied Jim Hamilton – who the Mole would have had as fourth choice second-row in the squad going into the tournament – had a big game against Georgia, and as loathe as I am to say it, clearly outplayed Nathan Hines. As a result, he finds himself paired in the engine room with Richie Gray in a truly enormous second-row partnership – roughly 250kg of Scottish beef. Jesus, that came over very Stephen Jones-esque, didn’t it? Hines finds himself on the bench, with Kellock out in the cold. 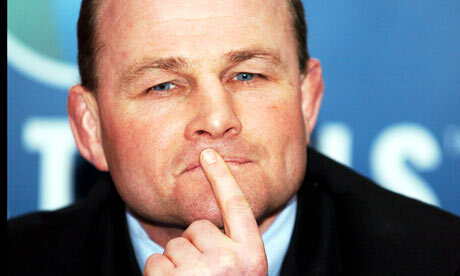 Himself and Euan Murray can knock about together, as the latter is taking this one off, due to his religious beliefs. Not going to open that can of worms – Robinson knew the score when he selected him, but it’s a match in which his scrummaging prowess could be well used. John Barclay comes back in at openside ahead of Ross Rennie, with Alasdair [so many varieties of the quintessential posh Scottish name in this squad] Strokosch retaining his place on the blind. Kelly Brown rightly gets the nod over Richie Vernon at No8. He was excellent against Georgia and doesn’t seem to go through the swings in form that too many of his backrow colleagues do: I’m looking at you, Richie Vernon [and, more to the point, the absent Jonny Beattie]. Rory Lawson retains his captaincy and partners Ruairidh Jackson in the half-backs, with Chris Paterson, the first Scottish player to play in four World Cups, making the team at fullback. Rory Lamont is unfortunate to miss out, but going with the flakey Jackson means that you need a capable place-kicker and a second strong option out of hand, and Paterson provides both. I’ve been impressed by Robinson’s selections thus far, and this is another good one. Dropping your captain is always an extremely tough call, and trusting in an attacking out-half who has potential but has never really done it for you at international level is a brave one. This entry was posted in RWC 2011 and tagged Alastair Kellock, Andy Robinson, Jim Hamilton, Nathan Hines, Richie Gray, RWC 2011, Scotland by dementedmole. Bookmark the permalink.